Perfect grilling tool for fish. The wide horizontal turner slips under the fish and holds it gently. The wide width makes this turner ideal for lifting, turning and transferring whole fish, and large cuts of beef & chicken. Dishwasher safe. Grab one for this weekend to enjoy on your grill this summer. 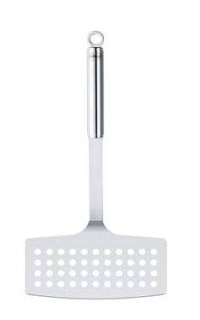 This grill tool is 25% off this weekend only and I can think of a many uses for this great spatula. Don’t wait to grab one this weekend only!